Eclectus parrots (Eclectus roratus) are bright, cheerful, and generally good-natured birds. They like being mated and can bond firmly with cage mates, but you cannot guarantee a good fit simply by putting a male and female together in a small space. Instead, a firm understanding of the differences in personality between genders and how to make a proper introduction will help the relationship proceed seamlessly. 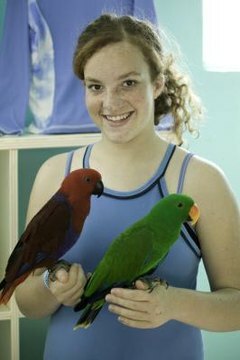 The best and easiest way to get male and female eclectus parrots to like one another is to raise them together from a young age. This allows them to become familiar long before they reach breeding age, which means they can form a bond without the added stress of mating desires. Since they do not become sexually mature for between two and five years of age, and sometimes as long as six, depending on species, this is a good while for them to become accustomed. When introducing older parrots, keep in mind that female eclectus parrots are traditionally more aggressive and rule the roost. That is not to say they are not loving birds toward their mates, babies and owners, because they are. But they direct the relationship with their mate from the beginning, dictating breeding, nesting and child rearing. Because of this, you should introduce birds deliberately and watch for bonding behavior like mutual feeding. If you want your birds to mate, give them wood to chew. This is a courtship ritual they engage in together in the wild. Once you see this behavior and they are consistently feeding together, you may place a next box in the cage. The female will then begin to outfit it and the male will initiate mating. It is important to provide plenty of food during this time so they do not abandon the attempt, and to be careful with handling unless you have a very strong bond with your birds. Be careful when giving your parrots supplements, as those that receive too many vitamins may become hyperactive and aggressive toward their cage mates. If one parrot is consistently aggressive toward the other, the pair might not be a good fit. If you want to keep a male and female in the same cage but do not want them to mate, avoid behaviors that could stimulate their mating drive, such as providing dark, cozy nesting boxes or inadvertently petting them on the back or under the tail.